A healthy blondie? Oh yes! 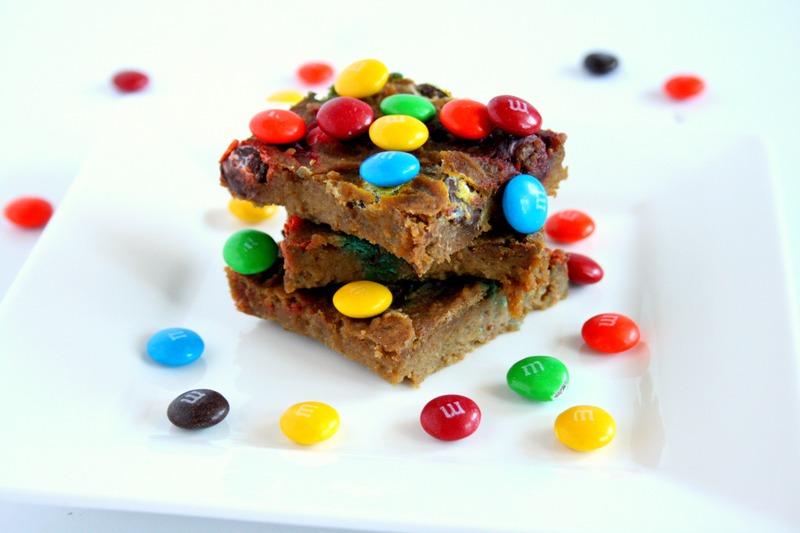 My Healthy M&M Blondies (Maw Maw’s Cookies) are flour-less and packed with fiber and protein. All thanks to one special ingredient! This month’s Recipe Redux challenge is definitely my favorite yet! We were challenged to share a healthy recipe and the accompanying story about one of our first cooking memories. Naturally, my thoughts went to my big Cajun family. I am blessed with a family that loves to cook. My dad’s side of the family is from Louisiana. When we visit my Grandparents, we are greeted with a big hug, kiss, and food. You are all familiar with my sweet tooth by now, so it should come as no surprise that I went straight to the tin jars filled with Maw Maw’s cookies. She made the BEST desserts! The most popular treats were her peanut butter chocolate rice crispy treats, ginger snaps, s’mores cake, pistachio pudding, and M&M cookie bars. Everyone had a favorite “maw maw treat”. Maw Maw remembered everyone and I mean everyone’s favorite treat. At the time that was 30 plus people! She would make everyone their favorite dessert for birthdays and special occasions. Her s’mores cake and her M&M cookie bars were my personal favorites. One of my first memories in the kitchen was baking these M&M cookie bars with her. She was so patient with me and would let me measure the ingredients and mix the batter. She always used the mini m&ms and let me eat a few while the bars were baking. Sadly, I couldn’t find them at the grocery store. I figured the large m&ms would work just as well for my healthy twist on her delicious cookie bars. I have to admit, nothing will beat my Maw Maw’s m&m cookies, but my healthy version puts up a good fight. They are fudgey, gooey, and delicious! Best of all they are flour less and packed with protein and fiber. How you may ask? My secret ingredient is chickpeas. Yes, chickpeas– the bean that goes in hummus. 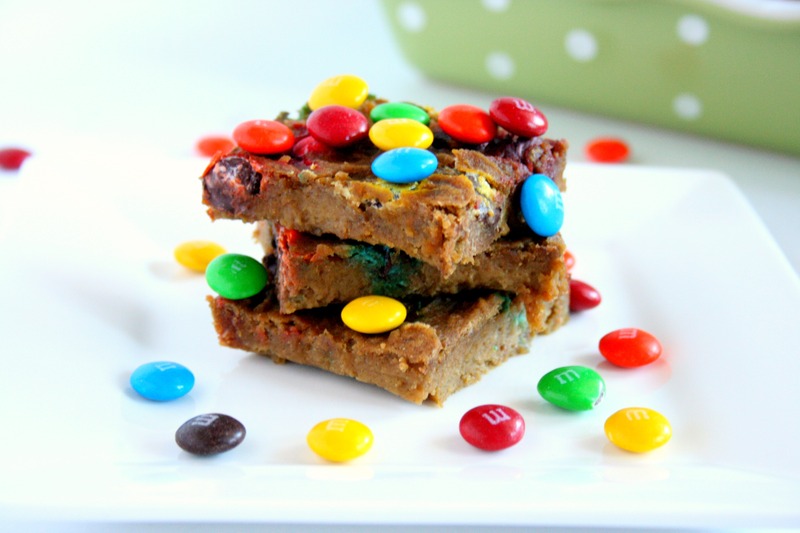 I know it sounds crazy, but trust me, they make the BEST Healthy m&m blondies! Chickpeas are a wonderful source of protein and fiber. When blended, they take on that fudgey like texture we all love in brownies. They have a relatively bland taste which enables them to take on any flavor profile (i.e. hummus or blondies)! Try them out today! I promise you won’t be disappointed! A healthy blondie? Oh yes! 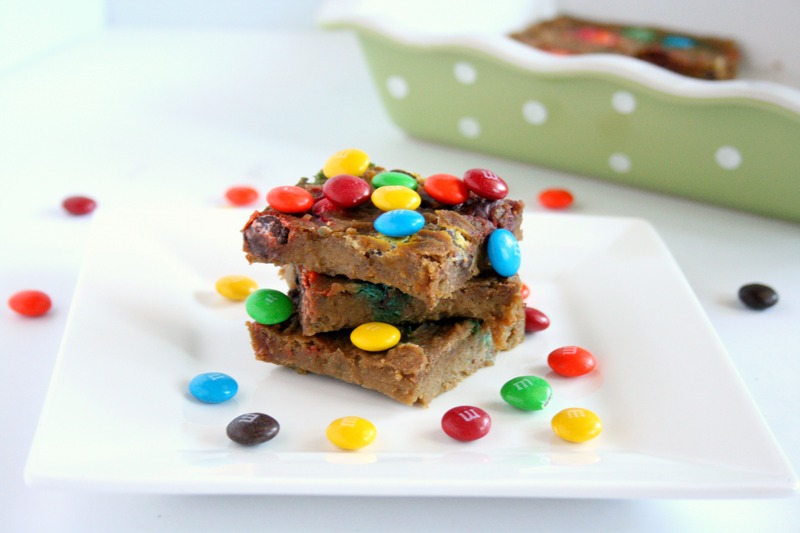 My Healthy M&M Blondies (Maw Maw's Cookies) are flour-less and packed with fiber and protein. All thanks to one special ingredient! Preheat oven to 350. Spray a 7x11 in baking pan with cooking spray. In a high power blender or food processor, combine all of the ingredients except for the chocolate chips and m&ms. Blend until the mixture is well blended. This may take some time. Take a spatula and scrap the sides of the blender to ensure everything is well incorporated. Once well blended, fold in the chocolate chips and m&ms (do not blend). For "fudgier" brownies be careful not to bake too long. There are many ways to enjoy your M&M’s and pair it with your all time favorite dessert! loved the idea.. i will prepare 4 my kids! !